All eyes were on these adorable kids when they walked down the aisle in some of our favorite Real Weddings! 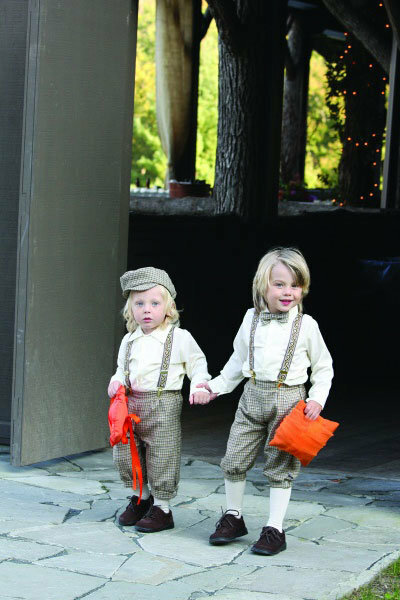 The ring bearers at Alexia and Blaine's outdoorsy wedding carry orange pillows that match the bridesmaids' bouquets. A flower girl poses against a wooden bridge at Sarah and Chris's wedding at a Chelan, WA winery. This precious flower girl opts for a sweet treat instead of basket full of petals at Jaime and Bryan's Fourth of July wedding. Photo Credit: Meg Hamilton of Rodeo & Co. The groom, Dave, poses with one of his little guests. Dave and his wife Bonny got married on a four-acre property in Sonoma, CA. This flower girl has fun in a yellow tutu at Birdie and Matt's rock-and-roll-inspired wedding in Santa Barbara, CA. A flower girl tosses petals from a handmade basket at Stephanie and Tom's outdoor wedding in Guerneville, CA. A ringbearer finds some shade under a parasol at Julie and Marc's Sonoma wedding. The couple chose the site among olive trees and grapevines because of its European feel. This two-year-old flower girl looks adorable in a white and red dress at Sally and Paul's wedding in Seattle, WA that celebrates their Greek and Lebanese heritage. Alex and Rich's adorable nieces march down the aisle at a vintage-inspired wedding in Napa Valley. The flower girls at Aspen and Brad's Halloween-themed wedding still looked young and sweet in black dresses with orange wings. The bride's nephew carries a lucky elephant down the aisle at Karen and Michel's second wedding in Encinitas, California. The four flower girls at Linda and Abel's Ibiza wedding look ready to hit the dance floor in white tutus and ballerina buns. This little girl plays dress-up at Loree and Gabriel's Montauk wedding. A flower girl at Jean and Michael's Napa Valley, CA wedding keeps cool with a chic parasol. The ceremony took place outdoors among trees, flowers and European-style fountains.